On Wednesday I went down to PDX to pick up family vising in Portland for the Thanksgiving holiday. As I waited for them to get off the plane and clear the security checkpoint I played around with the window display at the new Columbia Sportswear store (which is right before the security checkpoint at the A, B and C gates). 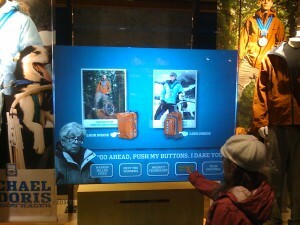 The Columbia Sportswear store has an interactive display window. You can touch the various icons on the window itself to get information about Columbia Sportswear and to play videos of their products in use. Most people standing around the window didn’t realize that you could interact with it, but the reception to it was pretty good when my daughter stepped up and started playing Warren Miller snowboarding videos on the full display window. The opportunities for a rich interactive retail experiences are so vast and it’s nice to see a non-technology company like Columbia Sportswear embrace new technologies for one of their keystone stores. Who knows maybe Microsoft will start promoting this technology as “Windows for Display Windows”.